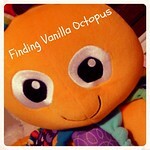 Finding Vanilla Octopus: Got Dolls? Apparently, they do a toddler good. Abigail is getting pretty creative with the names (she generally borrows them from her favorite books now instead of going with her old standby, "Abby"), though she's starting to get a little inconsistent. Just yesterday, she decided that Katarina (in the pink polka-dot dress) should be named "Mommy," instead.